In this article, Dave explains how you can save big money by seal coating your own driveway. Daves says that everybody knows that he owns run the best asphalt seal coating company on the planet. Thay usually does big projects. But today he will take us to a residential driveway. He will show us how we can save big money by seal coating our own driveway today. 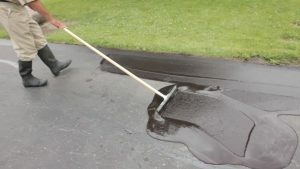 We’re on a residential driveway, and he is going to show us step-by-step how to seal coat our own driveway and save some money. The very first thing to do is trim the grass. It’s going over the edges of the driveway, and for that, we just use a weed whip. The next thing we do is clean the vegetation out of the cracks. For that, we’ll just use our weed web. The next step is to blow off the drive wing get the debris off the driveway. You probably don’t have a 13 horsepower billy-goat blower, but a handheld blower designed for residential use will be just as good. This next step is very critical, asphalt will not fit if it is too dirty and as you can see we couldn’t get all the dirt off the driveway by just blowing it. So we’re going to have to power wash this. One you probably don’t have your own power wash truck as I do. But an excellent residential power washer will work just fine. We blew this driveway off with a 13 horsepower ability go blower. It still isn’t clean enough for seal coating. After power washing, you can see how much dirt has collected in this water. It’s very very important that you get the driveway as clean as you can. Because asphalt sealer won’t bond to a dirty surface. The next thing you’re going to want to do is to let the driveway thoroughly dry just walk away from it. For a couple of hours after the driveway has thoroughly dried. The next step is to fill the cracks. A good quality crack filler. This one’s from Home Depot will do just fine. The next step is to choose a good quality rubberized asphalt sealer. You can find these in most home stores or good hardware stores. As file sealer is messy, you’re going to want to wear a pair of rubber boots or maybe an old pair of tennis shoes. You can just throw away now that the driveway is thoroughly cleaned the cracks are filled. It’s time to start sealing the first thing. What we do is, we cut the edges in with a soft bristled brush just like that nice and neat. Don’t get any sealer on anything it doesn’t belong on now. It’s time to start sealing the driveway we’re just going to use this 12-inch squeegee. I bought this at Home Depot. Now we’re going to pour two or three gallons of sealer on the asphalt pavement. I spread it off, this is very crucial that you push the material off and pull it back making sure that all of the crevices fill. I usually go up and down the driveway at least three times. At the end of the driveway, we’ll just run the opposite way so that we don’t get any sealer out now. We’ll just finish the driveway off with our cotton brush nice neat, clean even lines make the job of neat. That’s how you homeowners can get professional results at approximately half the cost. I’ve got 15 gallons of sealer on this at $3 a gallon and a $15 squeegee this actually cost me about sixty dollars to do. My estimate for this homeowner was 135 $. Hope now you know how you can save big money by seal coating your own driveway. Please feel free to drop your comments below. Please support us to spread free education articles by sharing this on social media.